NEW ORLEANS – Changes rocked the most recent installments of the NCAA Division III Outdoor Track & Field National Rating Index. We saw some major alterations in both the men’s and women’s charts as teams picked up the pace with the postseason right around the corner. Remember: The 2019 NCAA Division III Outdoor Track & Field Championships will be held May 24-26 at the SPIRE Institute in Geneva, Ohio. 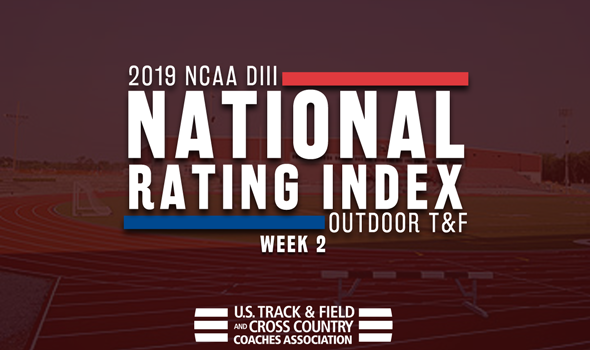 There were some major changes in the top-25 of the Men’s National Rating Index as nine teams jumped four or more spots between Week 1 and Week 2, including three that either went deeper inside the top-10 or made their first appearance this season. UW-Eau Claire had a huge weekend, which sent the squad from No. 6 to No. 2. Kyler Lueck was the biggest reason for the Blugolds’ improvement as he moved up to third in the TFRI Individual Rankings in the 1500 with his time of 3:48.97. Lueck now joins Dylan Cooper, who is ranked first nationally in the decathlon with 6914 points, at the top of the chart. UW-Whitewater and UW-Oshkosh both soared four spots from Week 1, putting them into eighth and ninth in the National Rating Index, respectively. Zach Jasinski gave the Warhawks their biggest boost as he vaulted to No. 1 in the TFRI Individual Rankings with a massive PR in the pole vault of 5.21m (17-1). The Titans’ 4×100 relay team got the baton around in 41.34, which left them fourth in the nation in that event. Further down, MIT jumped six spots from No. 17 to No. 11 and Adrian climbed 12 spots from No. 28 to No. 16. The Engineers’ Alec Reduker became the second NCAA DIII athlete to clear 2.14m (7-0¼) in the high jump this year and is tied for the national lead, while the Bulldogs now own the nation’s top-ranked 4×100 relay at 41.16. The biggest gainers in Week 2 of the National Rating Index include McMurry (up 45 spots), Principia (up 45 spots) and Capital (up 44 spots). Only two teams in the top-10 of the Women’s National Rating Index remained in place between Week 1 and Week 2: No. 1 George Fox and No. 7 Emory. Other than that, things changed. Washington (Mo.) and Redlands both moved one spot closer to the top. The Bears went from No. 3 to No. 2 after strong performances from Julia Dannenbaum (now ranked second in the TFRI Individual Rankings in the pole vault) and Eka Jose (now ranked third in the TFRI Individual Rankings in the triple jump), while the Bulldogs saw Chyenne Kimble improve her spot in the TFRI Individual Rankings in the heptathlon (No. 9 with 4608 points). Nebraska Wesleyan joined the top-5 for the first time this season. The Prairie Wolves were led by the 4×100 relay team (now ranked fifth nationally) and Maddie Fitzgibbons (now ranked sixth in the hammer throw in the TFRI Individual Rankings). Wheaton (Ill.) is back in the top-10 after a strong weekend. The Thunder, now ranked 10th nationally, saw a solid performance from its 4×100 relay team, which moved up to eighth in the nation behind its 48.12 finishing time. There were two new additions to the top-25 this week: No. 20 Loras and No. 22 Concordia Chicago. The Duhawks soared 15 spots from Week 1, while the Cougars climbed 23 spots. The two biggest gainers between Week 1 and Week 2 were Rhodes (up 39 spots) and John Carroll (up 37 spots).